Lane Cake HAPPY 11th BIRTHDAY EMMA! Aside from birthdays – it’s not too early for T-day treats is it? We’ve all got to plan ahead right? I know pie is the main attraction, but if you’re looking for an alternative – STOP right here! A quick confession – this photo is from last year’s cake – back when there was no blog – I hope you don’t mind – I know Emma doesn’t. 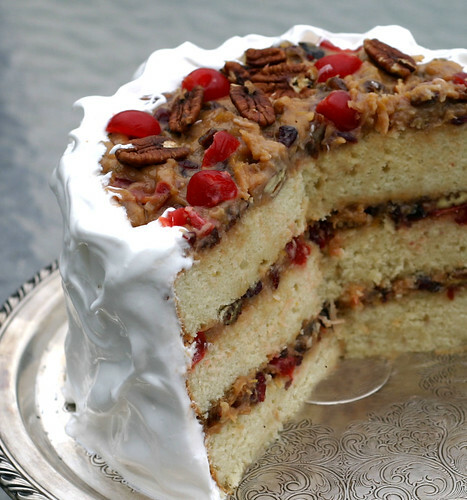 The first time Lane Cake graced our Thanksgiving table was in …are you sitting down? …..1983! Do the math – 26 YEARS ago! 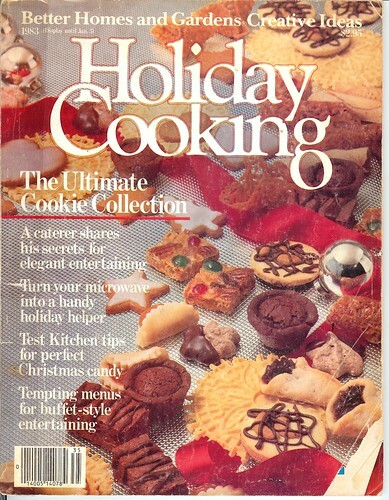 This was the year I started buying the Better Homes and Gardens Holiday Cooking Special issue and LOOK —– I STILL HAVE IT! I used to LOVE these magazines and had no problem buying them – even though I was a poor college student. It sure is a kick browsing through them every year. Lane cake is one of my favorites – I love the filling with all the goodies it’s even got brandy in it, the cake part is dense without being heavy and then top it all off with my childhood favorite fluffy 7 minute frosting. Fold in the beaten egg whites you did earlier. Place equal amounts in 3 – 9” round greased and floured cake pans. Bake at 375° for about 20 min. or until toothpick comes out clean. Cool thoroughly and spread on filling. 9 egg yolks SLOWLY while whisking vigorously! chopped pecans, maraschino cherries, chopped raisins or craisins or a combo and coconut. Turn off heat and cool to room temp. Place equal amounts (about 1 cup each) on each layer then stack the cake and frost the outside. Beat constantly for 7 minutes! Love the cake and love the jacket! BEAUTIFUL CAKE! 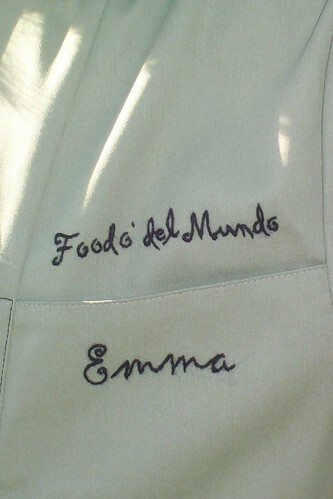 BEAUTIFUL CHEF’S COAT!! BEAUTIFUL YOU!!! the coat is really nice too. Beautiful Cake Happy Birthday Emma!! That looks terrific. If I make it , I just might be committed for the next 26 years. Not sure I could handle it. Oh god!!! so cruel to show me this before I’ve even cooked our lunch..anyway i canturn pumpkin and mooli into this??? fast? Nice cake, happy birthday Emma, the new hairstyle looks nice. Cool jacket! Happy belated Bday. Never heard of this cake but it looks interesting! Thanks! This looks great! What a lucky birthday girl! a dream! un vero sogno! Great looking Lane Cake. 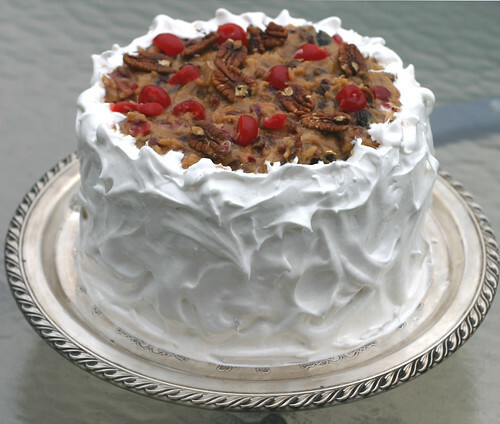 It’s a very traditional southern dessert – been eating it for at least 45 years! In my family, we do not use the traditional 7-minute frosting, just lots of filling, and lots of brandy! It’s a beautiful cake! The filling sounds delicious, and I love seven minute frosting. Your cake is so pretty it’s ridiculous! I looked at the BH&G cover and thought, oh how cute to be using a retro cookbook. Then I saw the year, 1983, which I remember vividly. Now I feel OLD! But, I won’t hold that against your lovely cake. Happy Birthday Emma! 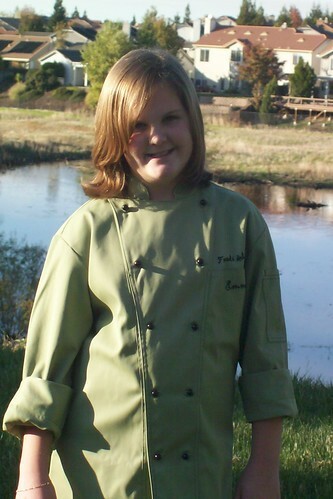 The chef coat is awesome! And talk about such a wonderful looking cake. Lane Cake was my wedding cake oh so MANY years ago! Lane cake is the greatest!! A lot of work, but totally worth it. The recipe I have (also from an old magazine) calls for sherry instead of brandy, and glace cherries instead of maraschino. I recently found out about italian natural-color candied cherries…I think these would be fabulous in it. This was my wedding cake, 1971 !